HAUL: H&M Spring items | Memorable Days : Beauty Blog - Korean Beauty, European, American Product Reviews. Even though i always look in the catalogue of H&M, I don't always purchase something from that shop. However, their current collection appealed to me. They have a lot of peplum tops in their current collection and lots of large necklaces and edgy rings where i'm totally in love with! Check out my recent purchases of their Spring collection! • White peplum top from h&m (link to the product) - they also have it in neon pink. I'm in love with the quality of this top! 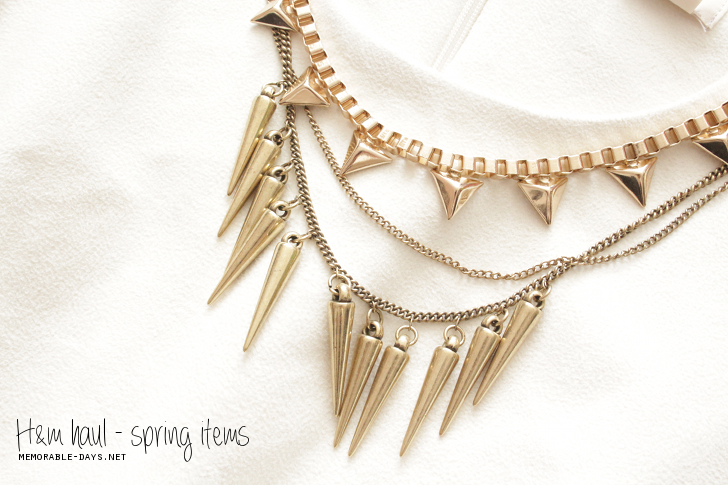 • Studs & spikes necklace from h&m - 2 separate necklaces, you can wear it individually as well as together. • Black wedges from zara - these aren't new but i like to match the top with these wedges. Who knows where i'm able to get more lovely peplum tops? Please let me know ^o^!